Mario's first Game Boy adventure is short, but sweet. Given the popularity of the Super Mario Bros. series at the time of the Game Boy's release, it came as no real surprise that Nintendo would release a Super Mario title for its brand new portable game system. Now the 3DS eShop is available, it makes just as much sense for Super Mario Land to be one of the first titles made available. For anyone that's ever played a Super Mario release, you should have a pretty good idea of what to expect from the gameplay in Super Mario Land. The controls are pretty much the same as those found in the NES titles: you can still make Mario run and he can even shoot off a super ball that will bounce around the screen and take out any enemies it touches, if you're able to pick up a Flower power-up. You'll even find the trademark Star power-up hidden in certain blocks that will make Mario invincible for a short amount of time. Your goal is to traverse each level and reach the exit doors: the bottom door will take you out of the level, but the more difficult to reach door near the top of the screen will give you a shot at playing an end-of-level mini-game where you can earn power-ups and free lives. There are basically four worlds in the game, each containing three individual levels to play through. The final level in each world features a boss boss fight, although they're generally very simple in design and execution, so you should have little trouble with them. There are two vehicle levels that allow Mario to take control of a submarine and an airplane that mixes things up a bit as well. 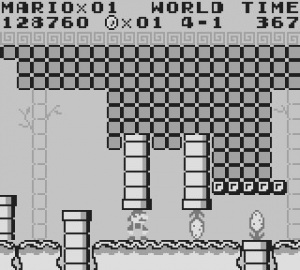 The levels are plenty long, but having only three per world makes each world really fly by, and given the overall lack of difficulty in each level, most players should be able to breeze through the entire game in less than 30 minutes. And given that there's not really any incentive to go back and locate any hidden items, there's very little replay value involved in the experience to keep you coming back for more. It's still a lot of fun to play through, just don't expect to feel any huge urge to do it again anytime soon. 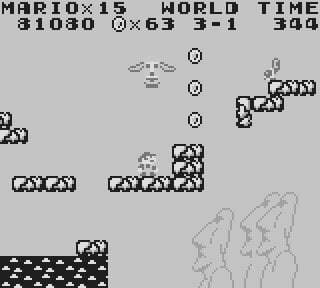 The visuals in Super Mario Land are about what you'd expect from a first-generation Game Boy release, and certainly look no better today than they did way back when. There's very little detail in the backgrounds, although some of the later areas do feature a good amount of detail in the foregrounds for you to enjoy. There's absolutely no parallax scrolling of any kind, and even the animations are fairly basic in design and execution. The music is easily the high point of the entire experience and Nintendo really did a superb job in somehow capturing the trademark Super Mario sound with the game's soundtrack. Every tune in the game features that same catchiness we've come to expect from the series and many of the tracks even fit in stylistically with the area in which they're played in. The Egyptian-themed track is a particular favorite among retro gamers and does a nice job of showing off the Game Boy's solid sound capabilities. The sound effects are hit and miss, but they're certainly not anything that could be classified as detrimental to the overall audio presentation. The musical score is so good you certainly won't mind the somewhat bland sound effects anyway. 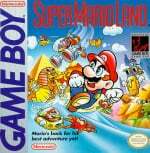 Super Mario Land was impressive when it was first released for the Game Boy, but given how the length and overall quality of Game Boy releases increased shortly thereafter, it only made this original seem even more inadequate by comparison. It's not the best launching-off point for the 3DS eShop — Super Mario Land 2: Six Golden Coins is by far the better game — and it is the most expensive of the launch Virtual Console titles at $3.99/£3.60. It's still a very fun Super Mario experience, but just about the time things are really getting good, the experience ends and the credits roll. If you haven't played Super Mario Land before, you owe it to yourself to at least give the game a try. The quest might be fairly short, but it's still worth playing through at least once, if only to see where Mario's portable adventures began. I Love it. Brings so many good memories back, having great fun playing it. Man, you sure wrote quite a bit on a game that's quite the classic! Were these based on impressions from not playing this game for a long time, or did you somehow not play this game before and these are your first impressions? Gosh, this takes me right back to my skool daze! Gr8. NostalgiaWare! But then I realised that the majority of the level designs were so bland, stupid and lack luster it was ridiculous...The stages were some of the worst designed stages in 2D platformer history. It's like Nintendo hired Monkies to put them together. plus the game was far too easy and hardly offered any challenge. It's like it did everything right and better than the first SML except for the stage design. Hands down, the best thing about the game was Wario's Castle. What? No classic green tint? ...that's not my childhood Mario. @Linkstrikesback & @Puregamer: Really? Sweet, I haven't updated mine, thanks for the clarification. Seeing this game in monochrome B&W just seems wrong to me and all I saw were the pics on this page and it being played in B&W on a 3DS on YouTube. I haven't bought SML, but kotaku reported that game boy games can either be played in black and white or with the green tint. @Corbie: Great review, as always! I probably would give it at least an 8, but that's just my nostalgic, Mario-fanboyistic opinion. It's been mentioned before, but the price seems too high for a 21/22 year old game. I'd pay no more than $1 or $2 for it. To put it in perspective, you can grab Fallout 1 and 2 - two of the best RPGs ever made, and certainly not short experiences - from GoodOldGames for $6 each. That includes downloadable manuals and artwork, and work done to ensure compatibility with current PCs. Maybe Nintendo will have Steam-style sales very now and then? The combo is L + R + Y.
I hope they release SML2: 6 golden coins. I was planning on buying this game, but disappointed to see we're still stuck buying points in increments. I'm not paying £10 to download a £3 title, at least until there are other games I want to buy. What happened to Zelda 3D and Link's Awakening? Would have been great to play those in the run up to Ocarina. Has anyone tried running it in original screen resolution? The 3D effect when you do is cool. I never liked this one, and it was the one Miyamoto wasn't involved in if I remember things correctly. The vehicles are like a bad idea from Alex Kidd. You know it is actually really funny; the power of nostalgia, that is. Last night I woke up feeling really sick at like 3 a.m., seriously like I had to throw up. But when I got up and didn't I decided to check if the eShop was up, and since it was I DL'ed SML. Seriously, the second I heard the first levels music it brought me right back to my childhood (SML was my first Game Boy game), and I kid you not, it actually made me feel better. Please tell me you're kidding. World 3-3 still is one of the hardest Mario levels outside of the Lost Levels. Ah I was wondering how you get the green tint! Now how do you get the Gameboy border on there like in the above video? @Link79: I believe he said to hold the Select button when choosing the game, and you will get the border. I know it is a rather cool easter egg! @Link79 Hold down Start + Select when booting up the game. This takes me back, spending many nights in bed when I was meant to be asleep! Whoops the sound on my computer wasn't working for some reason. I had to restart it. Sorry If I seemed like an idiot for asking how to get the Gameboy border. My mistake. I wonder if turning the volume all the way down would help with the 3DS's battery life. I think this game is harder than you give it credit for. Other than that, nice review. I own the cart and will STILL buy this game! Can't wait till I get my 3DS in two days. This game is really bad. The controls stink and the sprites are too small to see anything. SML2 is where it's at! I pretty much agree with you... but I'd lump in SML with SML2. Both are quirky bits of retro fun, worth playing for that reason, but both have pretty bad level design. 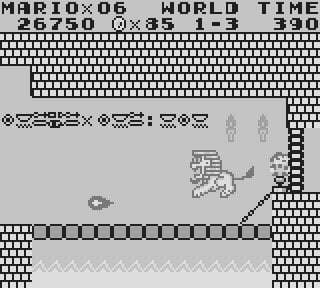 The first Mario(-ish) handheld game to truly show originality was SML3-Wario Land. It blows all its predecessors out of the water in every conceivable way. I can't wait for the Wario games to start appearing on the VC. Corrrect; Miyamoto had nothing to do with the SML games, and it shows, not only in the bland level design but also in the somewhat awkward controls and jump / run physics. Gunpei Yokoi was the producer, and I feel that the problem was simply that he was trying to make games for a series which doesn't match his style. Once he threw out the attempt to make a Mario game and started the Wario series, he started creating some of the best and most original handheld platformers of all time. Thanks for the review Corbs. I'm saving my poin--money for something better, though. I remember having gotten this game many years ago (I still have it). I think the first Super Mario Land is decent, but not great. I do like the shmup stages in both the second and fourth worlds, and the music is good, I agree. I would've given it a 6, but I still think it's cool. It's a bit short, yeah, but fun while it lasts. R.I.P. Gunpei Yokoi. I'd much rather replay SML than SML2, just to hear the music. This game is so fun right now. This was actually the first Mario game I really played as I never owned or played a NES. I always loved this game, although looking back at it now, I do agree that the controls aren't the best, but it's still a great game and I always loved the audio, particularly the music when you beat the game. Looking forward to hearing it again. No kidding it's short. I'm not too sure about HALF an hour, but I definitely beat it in under a full hour last night. It is a bit harder than I remembered, but I managed to beat it without having to load a save state. Also, HUZZAH for save state functionality! Seriously, it was sorely missed on Wii VC as compared to other ways to play games...(I mean PS3 versions, folks ). Anyway, great game at it's time! I was expecting an 8 but given how short it is, a 7 seems understandable. I thoroughly enjoy this game and I am glad I bought it. I remember this one scoring a 9/10 on the retro section, last year during GB anniversary, but I understand this overpricing on VC really can make a difference on the score. An 8/10 for me. Enjoyable. Are any journalists asking Nintendo why they hate their non-US customers? Even after taking sales tax into account, the Japanese have to pay a 20% premium and we in the UK have to pay a whopping 23% premium over our American friends to buy this game. This is for the same digital product with almost no storage or distribution costs. How can such massive price differences be considered acceptable in the modern world? Is it a symptom of the monopoly that Nintendo, Sony and Microsoft have over their own digital stores? Without competition there is no incentive to set acceptable prices. In the eshop it asks for your county for tax purposes, so does that mean you have to pay taxes on the games you buy? For me even a 7 is a little bit high. I would give the game a 6, it just isn't THAT good. The Wario Land games count too. I'd say a 7 is about right. An 8 is definitely too high but a 6 is saying its only slightly better than average which it isn't. Its still perfectly playable and fun today, it may be short but I think many people will have trouble with the final world. It'll still take them a while to see everything although it can be completed quickly if you're know the game very well. Actually picked this up a couple weeks ago, and I must say, It's a nice one for the price. But I'm having trouble with it, challenge-wise. Keep the VC coming, Nintendo. Everything is too small. It's hard to see certain enemies approaching. The collision detection is terrible. If it weren't for nostalgia and the awesome music, I'd give it a 5. I'm sorry but THATS a bit low. it should be an 8/10. its a very easy and fun game. find the secrets to Super Mario Land! @LordTendoboy I beat this game and I love it. I think people shoudn't judge a game by its difficulty. I don't mean to judge you, LordTendoboy. its just that just because of the hard difficulty, doesn't mean its a bad game. if you don't mine me asking. how long have you played this game? It might be short, it might be basic, but it is still a lot of fun. Like the review says, the soundtrack is remarkably contagious. Worth the few dollars that it costs.